In November, (the first full month after the release of OS 2.1) saw 90.8% of BlackBerry PlayBook users running newest available operating system. At the same time there is almost nobody left using an OS prior to version 2.0, with 99.6% of PlayBooks running OS 2.0 or newer. This data was collected by AppWorld at the time of download, for the popular PlayBook strategy game Pixelated. 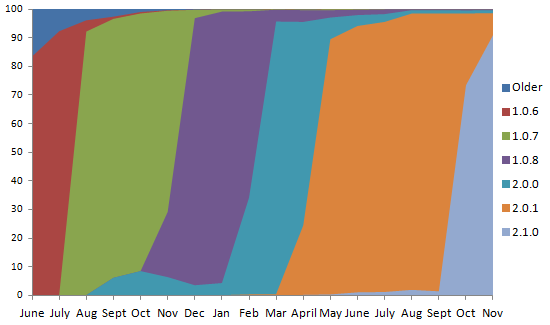 Data shown on the chart is from the beginning of June 2011 through the end of November 2012.